Stir-fried with your choice of meat with broccoli, baby corn, onion, carrots, mushrooms and bamboo shoots in special brown sauce. Stir-fried with your choice of meat with Thai special chili paste, served with steamed broccoli. Stir-fried with your choice of meat with bamboo shoots, pepper, onion and sweet basil leaves in chili garlic sauce. Stir-fried with your choice of meat with onion, green onion and pepper in chili garlic sauce. Stir-fried choice of meat with pepper, cucumber, onion, pineapple and tomato in Thai sweet and sour sauce. Stir-fried choice of meat with bamboo shoot, pepper in chili sauce. Special hot fried yellow curry with your choice of meat, coconut milk, green peppers, red peppers, pineapple and onion. 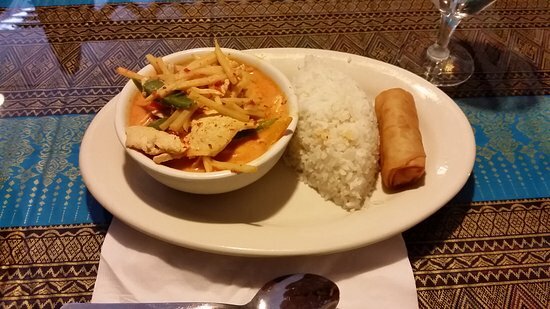 Special thai curry with your choice of meat, coconut milk, green peas, green peppers, red peppers, eggplant and fresh basil leaves. Special hot fried curry with your choice of meat, coconut milk, onion, carrots, green peppers, red peppers and lime leaves. Masamon curry sauce with your choice of meat, coconut milk, carrots, onion, potatoes and peanut. Fresh lettuce, carrots, bean sprouts, cilantro, cucumber and tofu wrapped with rice paper served with plum sauce and ground peanut. Cream cheese, crabmeat, green onion wrapped with wonton skin, served golden brown with house sauce. Grilled chicken breast marinated in special sauce on skewers. Served with peanut sauce and cucumber salad. Deep fried fish, served with special Thai curry paste, served with ground peanut in a sweet and sour sauce and cucumber. Shrimp​ wrapped with wonton skin, deep fried to a golden brown and served with plum sauce. Deep fried wonton, stuffed with ground chicken in special Thai seasoning, served with homemade sauce. Deep fried bean curd, served with sweet and sour chili peanut sauce. Battered deep fried squid, served with lettuce, cucumber and special sauce. Deep fried crackers. Made from shrimp. Thai's​ famous hot and sour soup with straw mushrooms, lime juice and Thai chili paste. Thai style stir-fried rice noodles with your choice of meat, egg, bean sprouts, and green onions, topped with ground peanut. Stir-fried rice noodle with your choice of meat and chinese broccoli in soy bean gravy. Crispy egg noodles with your choice of meat, and mixed vegetables in soy bean gravy. Stir-fried bean thread noodles with your choice of meat, egg, and mixed vegetables. Rice​ noodles with tender sliced beef with special seasoning in chef's flavored soup. Egg​ noodle soup with stewed duck, bean sprout and green onion. Rice noodles in clear soup with combination of shrimp, scallop, crab meat, calamari, bean sprout and green onion. Served with steamed rice. Additional rice for 1.50 extra. Special Thai curry paste with your choice of meat, coconut milk, green peas, green pepper, red pepper, eggplant and fresh basil leaves. Special hot fried yellow curry with your choice of meat, coconut milk, green peppers, red pepper, pineapple and onion. Stir-fired with your choice of meat with bamboo shoots, pepper, and sweet basil leaves in chili garlic sauce. Stir-fried with your choice of meat with sweet basil leaves, red and green pepper and Thai special chili paste in garlic sauce served on steamed broccoli and carrot. Stir-fired​ with your choice of meat, with onion, green onion, and green pepper in chili garlic sauce. Shrimp​ stir-fried with 3 kinds of mushroom and green onion in oyster sauce. Shrimp and chicken stir fried with baby corn, carrots, onion, mushroom and green onion. Shrimp, scallops and calamari stir-fried with mung bean noodles, baby corn, pea pods, corn, napa cabbage, mushroom and onion. Golden brown shrimp or salmon on a bed of steamed broccoli, cabbage, and carrots. Topped with special crushed peanut sauce. Boneless duck stir with mixed vegetables in special house sauce. Stir-fried choice of fish with pepper, cucumber, onion, pineapple and tomato in Thai sweet and sour sauce. Sizzling beef marinated in special sauce, served on hot plate. Boneless​ honey roast duck with special sauce served on a bed of fresh lettuce and carrots. Nous y sommes allés pour un voyage en famille. Tout le monde a beaucoup aimé la nourriture. Authentique cuisine thaï. Je le recommande vivement. Il n'est pas luxueux. Comme d'habitude, la nourriture excellente. Je ne peux pas juger par l'extérieur ! Bonne nourriture thaïlandaise ! Obtenez des réponses rapides du personnel et personnes ayant visité le SIAM Square.